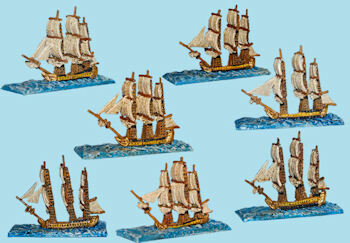 This boxed set contains 15 ships for the Spanish fleet. These beautiful 1 piece castings are done in white metal. This set includes: 1 x 136 gun ship, 3 x 112 gun ships, 4 x 80 gun ships, 6 x 74 gun ships and 1 x 64 gun ship. The photo is a representation of the ships that come in the box, 1 from each type of ship). 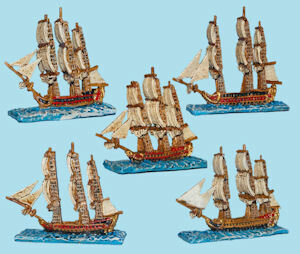 This boxed set contains 25 ships for the Spanish fleet. These beautiful 1 piece castings are done in white metal. This set includes: 4 x 80 gun ships, 7 x 74 gun ships #1, 7 x 74 gun ships # 2, 5 x 40 gun ships and 2 Brigantines. 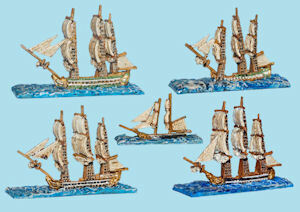 This boxed set contains 31 ships for the Spanish fleet. These beautiful 1 piece castings are done in white metal. This set includes: 3 x 100 gun ships, 4 x 98 gun ships, 1 x 80 gun ship, 8 x 74 gun ships # 1, 8 x 74 gun ships #2, 3 x 64 gun ships and 4 frigates. This boxed set contains 18 ships for the American fleet. These beautiful 1 piece castings are done in white metal. This set contains: 3 x Early American 74 gun ships, 3 x Late American 74 gun ships, 3 x 173 ft. 44 gunners (Constitution class), 3x 163 ft. Frigates 36-44 gunners, 3 x 143 ft Frigates 32-36 gunners, and 3 x East Indian Trade Merchantmen.